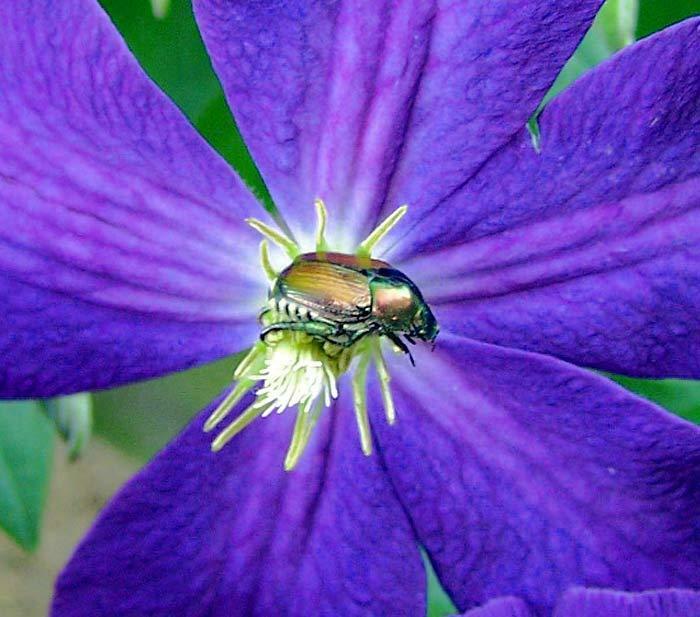 Japanese beetles are primarily a pest in the eastern U.S., though they turn up west of the Rockies from time to time. Their appetite for a wide variety of plants makes them especially troublesome. Adults feed on just about every kind of ornamental and edible crop, sometimes in disturbingly large crowds. They chew leaf tissue from between the veins, leaving a lacy skeleton. Prior to pupating, the 1-inch-long, white, c-shaped grubs live in the soil and feed on the roots of many plants. Grubs are often a problem in lawns. Japanese beetles are easy to see and are fairly easy to knock into a can of soapy water. Yellow target traps baited with a pheromone attractant work, but sometimes too well. Don't place one near your garden or you'll be pulling beetles in from all over town. Deter feeding by adult beetles by spraying plants with neem oil. Use parasitic nematodes in lawns and garden beds for grub control.